For most of us, the kitchen is the hub of the home. At any given time (even a midnight snack gathering), you will find the kitchen is where the action is. But, let’s face it, if the kitchen is a disorganized mess, it will no longer be the most popular place in the house. The kitchen should be the center of the home and a place that is warm and welcoming rather than messy and mixed up. 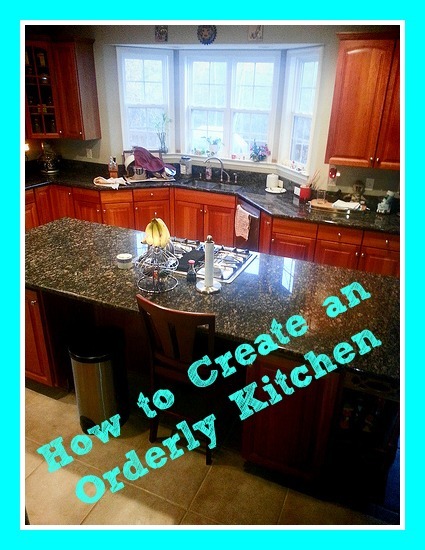 There are several great ways to keep an orderly kitchen. Rule number one for any orderly kitchen is to put everything that is on top of the countertops away. Even if it is something you use everyday, place those items in the cupboards above or the cabinets below. Taking everything off the countertops makes the kitchen look neat and organized, and it also makes it appear larger. In order to make your kitchen more efficient, it is necessary to give it a thorough clean-out once in a while. Check to see what you have lurking in the back of your cabinets, and see if there is anything such as flour or sugar that has expired. Chances are you needed to make a recipe with a little flour and are now stuck with a five pound bag of it. Once you have purged, you can go ahead and reorganize the items you need most frequently by moving them up front and center. One of the best ways to organize a kitchen is to organize by category. Place all of your canned goods in one area and all of your baking goods in another while your spices are in their own little world. A great way to organize your kitchen and make it more efficient is to use baskets. When you clump a set of ingredients for a special meal you love into one basket, all you have to do is pull out the basket, use the ingredients, and store it right back away again. This saves you time and keeps everything nice and organized. Make as much use out of your walls as you possibly can for optimal efficiency. Shelves that can store food processors, blenders, and special kitchen gadgets leave more room on your countertop for the actual preparing of meals. With a little effort and a little extra planning, your kitchen will run smoothly and efficiently and be a joy for the whole family.